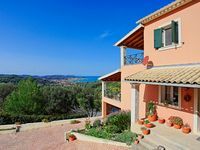 Property 11: Corfu Story!Breathtaking view ! Property 13: Kineri Country House: "An Exotic Mediterranean Escape"
Property 17: HOUSE DOUKADES, Ολόκληρο εξοχικό σπίτι. Fantastic villa Holiday house Paradise Beach Agnos on Corfu for 8 persons with pool. Property 20: Fantastic villa Holiday house Paradise Beach Agnos on Corfu for 8 persons with pool. Property 23: Private, Cozy Decorated, Fancy And Modern Cottage With Sea Views And Garden. Charming and traditional small stone house. Property 33: Charming and traditional small stone house. Property 41: Corfu Lemon House. The residence is located in the village of Prinylas in Corfu. Kaminaki Villas Nikos: House With Pool Next to the Beach of Kaminaki! Property 50: Kaminaki Villas Nikos: House With Pool Next to the Beach of Kaminaki! Very nice and big objekt on the hills, wunderful view on the sea, excellent and modern furniture, warm colors and clean rooms. A little present waited for us and the owners welcomed us heartly. We missed nothing and felt like home. Every equipment and installations worked well. The contact to the owners and Eos was friendly. There was so much extras for our little children. You got all stuff for a barbeque and 5-10 minutes away there are post office, supermarket, gas station, restaurants and the beach (you will find small and larger beaches every 15 minutes at the route, but you need a car). There were no problems to find the house with our smartphone (just the way out of Corfu was a little bit tricky). Don't miss Angelocastro, the village Old Perithia, Pantokrator, the old and new fortress of Kerkyra (Corfu Town), Mon Repos Palace, The Achilleon, Canal damour and Acharavi when you are in the north. Friends recommended Kaminaki as they'd had a good week there in June. We were delighted with the village, the property, and Corfiot people, who are some of the friendliest hosts we've encountered. We did think, though, that we'd have enjoyed it much less without a car: the landscape is extremely hilly and the weather was very hot, despite it being the middle of September. Kaminaki is a quiet little suburb of Nisaki, a larger village along the main road with two grocery shops (including the redoubtable Aphrodite's - a must-visit) and a wonderful taverna called Vitamines - many thanks to Dina and Vasilis. Much of the property in Kaminaki is let to tourists during the summer season but the village is so small it wasn't ever noisy.. There is no shop in Kaminaki itself, despite what some guide books say - it closed down some time ago. There are two tavernas, Spiros (which looks good but we didn't eat there) and the Rocks Taverna, with spectacular views. The beach is small and not at all crowded, though people who want a quiet swim do drive to Kaminaki but I found the shingle (stones) just as challenging as those of my home town of Brighton. The most exciting thing we did in Kaminaki was to hire a speedboat from Cassie and Dimitri who operate from the beach.The accommodation was very good, a reasonably-priced maisonette on two floors with three bedrooms, two bathrooms and a fully-fitted kitchen. While modernised some time ago, the apartment was very well equipped, and was kept spotlessly clean by Maria, and the water supply was good. Any problems that arose - light bulbs gone, etc. - were quickly dealt with by EOS. Do be sure to ask in advance for a mattress topper for the double bed. The only niggle is that the Wifi service is erratic so there were times we couldn't make calls. Altogether, a splendid holiday!